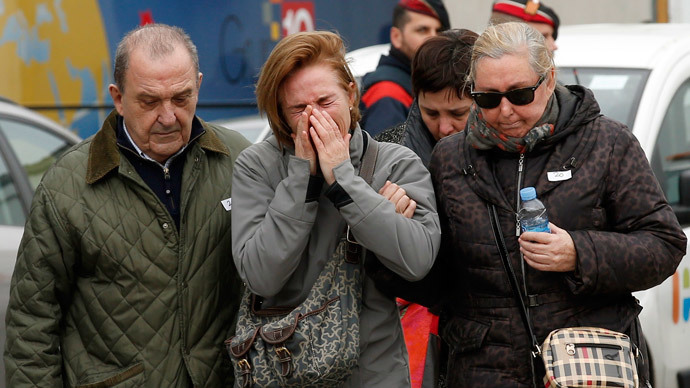 None of the 150 passengers and crew are thought to have survived the Germanwings A320 crash into a steep hillside in the French Alps. “It’s an apocalyptic sight,” said district MP Christophe Castaner, after surveying the crash site from the air. More than 600 emergency staff and police are working at the crash site, which is spread over 20,000 square meters, after setting up an impromptu airfield, where over 10 helicopters are present. "The first task for the police as soon as we reached the crash site was to try and find survivors. Unfortunately, as far as we can say at the moment, there are none," a police representative said during a media conference staged at a local village hall. Spanish authorities have said that of the 144 passengers and six crewmembers on the budget airline route, 67 were Spanish and 45 Germans. Turkey’s Dogan News Agency also reported that 39 of the passengers had Turkish surnames, but country's foreign ministry later stated that only one of the passengers was a Turkish citizen. The largest group of victims on Flight 4U9525, which was flying from Barcelona to Dusseldorf, is feared to comprise 16 teenagers from a school near Dusseldorf, who were in Barcelona on a weeklong exchange trip. “We know that the school group boarded the plane," said Sylvia Loerhmann, the education minister for Germany’s North Rhine-Westphalia state. There were also 2 infants of less than two years old registered for the flight. Gloomy relatives arriving at the Dusseldorf airport were shepherded away to a separate building, which had its curtains closed to avoid media intrusion.